One of the only issues we have with the GTX 770 concerns Nvidia's decision to drop the lovely trivalent chromium plated cooling solution from the GTX Titan and 780 onto it. We had no problem with the level of cooling it affords and we certainly had no problem with the look - it couldn't look any more bling unless it had a diamond-studded hubcap in the middle of the fan housing. The problem is that the only way for card manufacturers to differentiate themselves is to design own-brand cooling solutions and slap them onto their cards, maybe with a hefty overclock to boot. And that's exactly what EVGA has done with this Superclocked version of the excellent GTX 770. So instead of the matte-finished, LED-lit, robust Nvidia cooler, EVGA has gone with its brand new ACX (we're not using the word "Xtreme", EVGA) cooling array. Instead of the trivalent chromium plating, we've got plastic surrounds and a couple of chunky fans. It would be shallow indeed if our big concerns around a new graphics card launch were about its aesthetics alone, but it's a fact that no matter how good the cooling performance of such a replacement chiller on either a GTX 780 or GTX 770, they're going to suffer by visual comparison. And that's a shame, because the ACX cooling is really quite impressive on these Superclocked cards. Like EVGA's GTX 760 version, this GTX 770 iteration manages to chill the GPU down by at least 10ºC. The stock cooler, as good-looking as it is, still gets rather hot when you apply some serious graphics loads. We were knocking around 80ºC with the Titan-esque cooler at 100 per cent GPU load - this Superclocked card, on the other hand, is sitting resolutely at 69ºC. We couldn't spot much difference in general acoustic levels with the out-of-the-box settings; the top-end Nvidia reference cooler is pretty good regarding standard noise levels. The chunkier fans mean the ACX cooler doesn't have to spin up so quickly to dissipate the heat, so it shouldn't hit the same top-end noise levels. But what about the actual gaming performance of this factory-overclocked card? The standard GTX 770 is already impressive, batting ahead of the GTX 680 it's essentially replacing, and even this OC version is cheaper than any GTX 680 I've found. The Active Cooling Xtreme chip chiller on EVGA cards is really impressive, especially up against the lovely high-end Nvidia reference cooler. Being able to stay below 70ºC - even when the chip is dialling up to 1,228MHz with GPU Boost 2.0 in its out-of-the-box state - is quite a feat. In real terms, this Superclocked card doesn't really offer much in terms of extra gaming chops, compared with the reference card, which can easily be pushed up to the same levels as this pricier version. 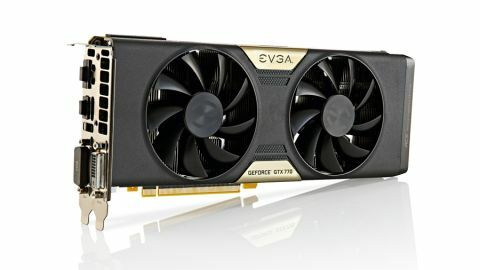 What you do get for the extra money you're spending on EVGA's Superclocked GTX 770 is a card that can hit those top clocks without melting the silicon inside your expensive new GPU. It will happily run at the enhanced clock speed, at lower temperatures than the standard card can manage running slower. Combined with EVGA's warranty support, this overclocked card is worth a look for that impressive ACX cooling alone. So long as you don't mind ditching the chrome, that is.